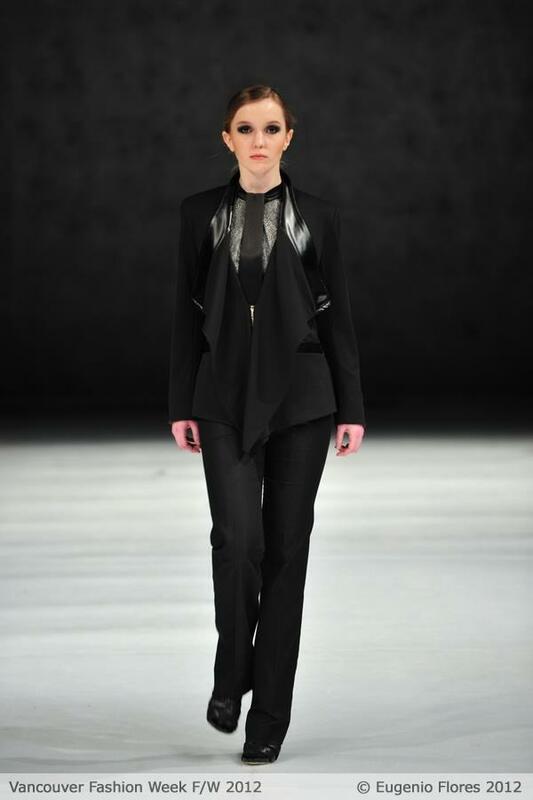 VAWK designer Sunny Fong has come a long way since his days as a winning contestant on Project Runway Canada. 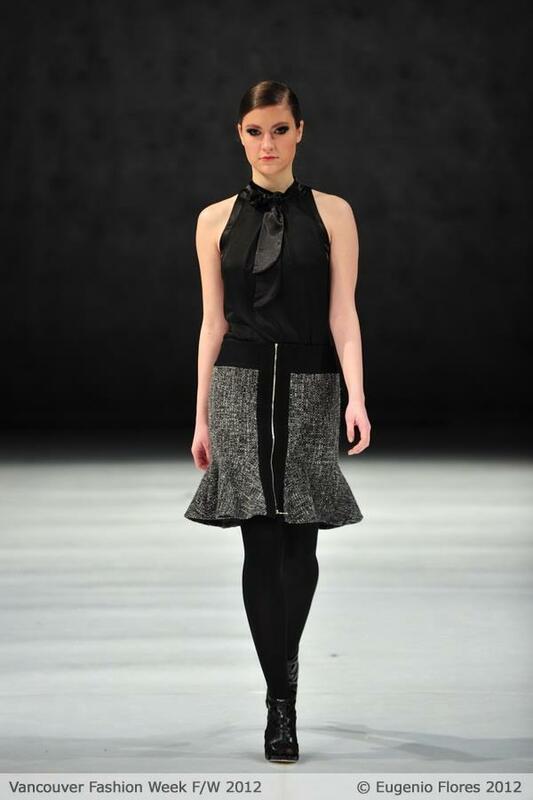 His attention to detail and immaculate designs for his luxury women's wear label have earned him devoted fans and accolades from some of Canada's top fashion publications. 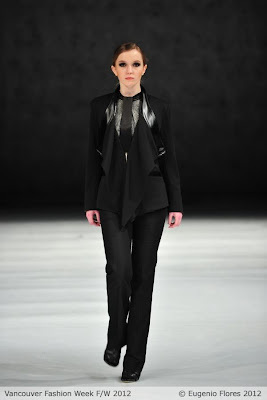 I had the privilege of seeing his fall/winter 2012 collection firsthand at Vancouver Fashion Week this season. For VAWK's latest collection, Fong turned to Japanese culture and science fiction, particularly the idea of the sci-fi samurai. According to Fong's vision, the VAWK woman, it seems, is elegant enough to attend a gala but carries herself with enough attitude and grit to hold her own amongst warriors and cyborgs. His inspiration translated into kimono sleeves and wide obi-style belts. Leather and fox-trimmed coats, jackets, and blazers juxtaposed sharp tailored lines and sleek silhouettes with soft draped collars. Leather tattoo koi graced a backless gown. 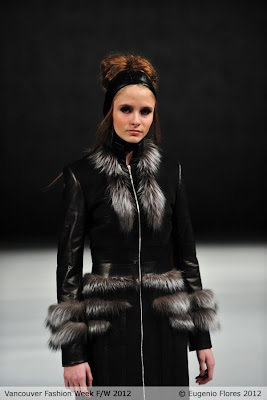 Models sported leather helmets and topknots. The colour palette was simple: mostly black with some rich plum in the form of silk dresses. A touch of gold in the form of leather trim and sequinned pieces conveyed the same hard-edged beauty a samurai sword might hold. This season also marked the debut of a new sister line called VAWKKIN. Inspired by the modern working woman's need for a seamless wardrobe that transitions from work to play, VAWKKIN incorporated menswear influences into very wearable (and feminine) separates. Think the sharpness and refined detail of VAWK, but done in fabrications and styles that work for the office or cocktail hour. The minimalist colour palette of black-and-white patterns, solid black, grey and teal allowed focus to shift to compelling design details like a bow on the shoulder of a blouse, or a ruffle along the bottom of a coat. Both shows marked the first time Fong has ventured westward and shown his work in Vancouver. Considering how impressive I found his work to be, I can only hope he visits us more often in the future. I really like that last grey dress. Just my cup of tea. VAWK had some wicked jackets.